For The Filling: In a medium saucepan over medium-high heat, add 1 cup sugar, the flour, cornstarch and salt; stir to combine. Add the water, lemon juice and zest and bring to a boil, whisking frequently. Whisk in the butter. Place the egg yolks in a small bowl and gradually whisk in ½ cup of the hot lemon mixture. Whisk the egg yolk-lemon mixture back into the saucepan with the rest of the hot lemon mixture. Return the mixture to a boil and continue to whisk constantly until thick. Pour the mixture into the baked pie crust. For The Meringue: In a large mixing bowl, beat the egg whites with an electric mixer on medium-high speed until they become foamy. Add the vanilla extract and cream of tartar, then add the sugar gradually, continuing to beat until stiff peaks form. Spread the meringue mixture over the pie, extending it to the edges of the crust. 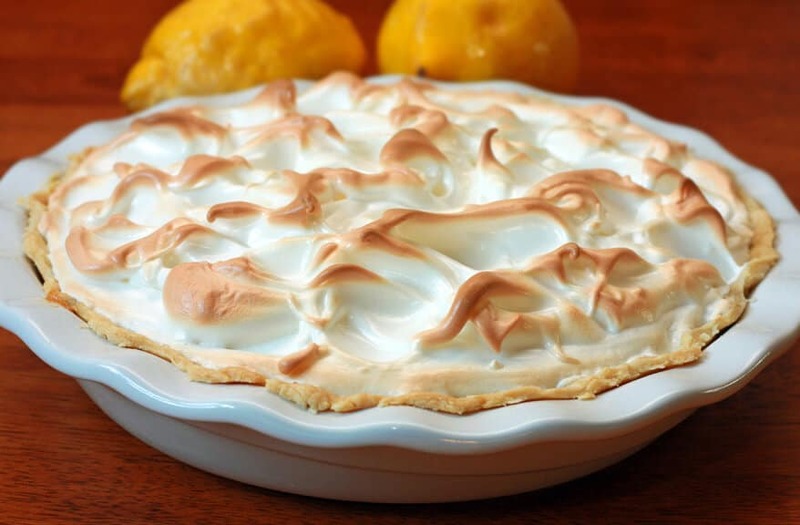 Bake for 10 minutes, or until the meringue is golden brown.